Here is a heads up for those looking to finally get some hot poker action on the go in full Xbox Arcade glory! 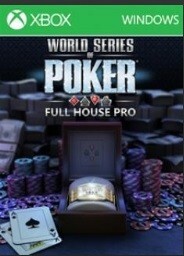 World Series Of Poker: Full House Pro is now available on Windows 8 with Xbox achievements and all! Back in December we highlighted the upcoming title available right now to download for your Windows 8 device. The title is true to the original on Xbox 360, but we are told that the performance and gameplay is actually better. Check out the trailer and head past the break to download the epic title FREE today! Written by: MBGW on April 9, 2014.